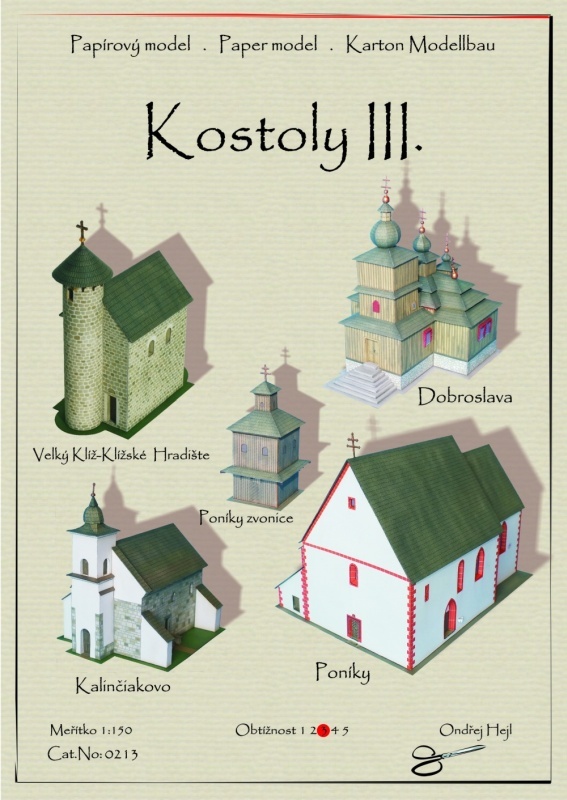 Set of 4 modeles of churches in 1:150 scale. Scale: 1:150 designer: O. Hejl skill level: 2/5 Sheets with parts: 1 assembly drawings: 1 Model of Orthodox Church of the Lord meetings with Simon in Kozany, Slovakia (1760) in 1:150 scale. scale: 1:150 designer: O. Hejl skill level: 2/5 sheets with parts: 1,5 assembly drawings: 2 Model of Sklenarka, historic home of the old winery in Prague, Czech Republic (17 c.) in 1:150 scale. scale: 1:150 designer: O. Hejl skill level: 3/5 sheets with parts: 6 assembly drawings: 3 Model of church of St.Bartholomew in Hrádek nad Nisou, Czech Republic (late 13 c.) in 1:150 scale. scale: 1:120 (TT) designer: O. Hejl skill level: 3/5 sheets with parts: 6 assembly drawings: 6 Model of four railway buildings in 1:120 (TT) scale - signal box, warehouse, toilet and locomotive shed. scale: 1:87 (H0) designer: O. Hejl skill level: 2/5 sheets with parts: 3 assembly drawings: 2 Model of railway station in Rovensko, Czech Republic in 1:87 (H0) scale. scale: 1:120 (TT) designer: O. Hejl skill level: 2/5 sheets with parts: 2 assembly drawings: 2 Model of railway station in Rovensko, Czech Republic in 1:120 (TT) scale.